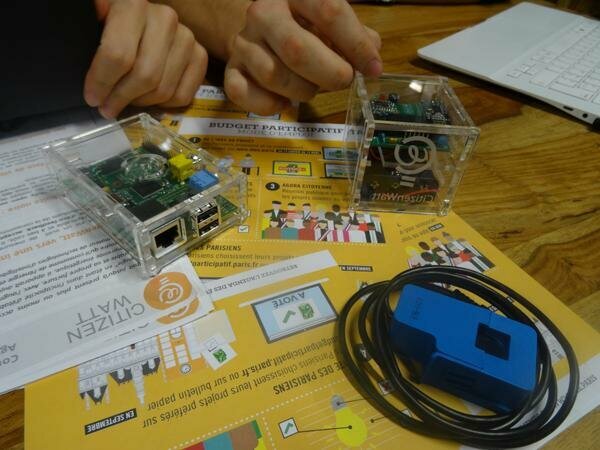 We started to work on CitizenWatt a year ago. Maybe it’s time for a quick summary about this exiting project in collaboration with Capteurs Citoyens and HackEns. This project is about creating an open hardware electricity consumption monitor, that gives a user-friendly feedback to the whole family. It enables them to monitor and to reduce their consumption by understanding what consumes energy and what is not. We designed a simple sensor that can run on battery, as not anyone have a power plug near the electric counter. Based on OpenEnergy Monitor design, we simplified it so it cost less that 30€ to make. Also, we changed the RF technology with NRF24L01+, a 2.4GHz low cost and easy to find transmitter. We used rechargeable AA batteries as the power supply for the ease of use by a non-technical people, but our design is compatible with single cell LiPo battery, with its JST connector. The sensor sends the measures to a Raspberry Pi that keeps the data inside the house. It can be displayed on a web device (phone, computer, smartTV, etc…). It never goes to a cloud. It stays in the house, as we value privacy. 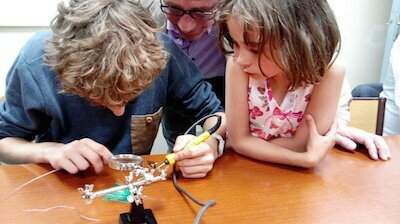 We organized a few meeting where families, parents and children, made their sensors, soldering components for the first time. It was great events, with experts and beginners. CitizenWatt is now installed in a few flats in Paris, giving us our first real life feedbacks. Now, we need to fix the flaws and improve the WebUI, according to them. Finally, I would like to thank the CRI and the city of Paris for their support along this year.